FROG POOL PRODUCTS Keeping your pools water fresh and clean without a ton of work is every pool owners dream, however with so many different types of pool chemicals, finding the right pool water care products can be a nightmare. 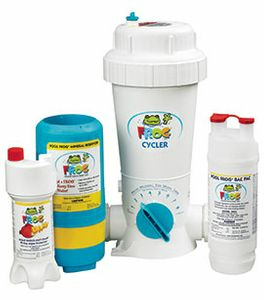 Not anymore, Pool Frog pool products are the only Fresh Mineral Water systems designed to keep your pool water cleaner, clearer, and softer, while cutting your swimming pool’s chlorine use by up to 50%*. Whether you have a 2,000 gallon INTEX ® soft-sided swimming pool or a custom designed 40,000 gallon in-ground pool with a built in hot tub and a waterslide, POOL FROG has all the pool water care products you need to to keep your swimming pool water clean and clear all summer long, without the hassle of having to measure out and handle chemicals.